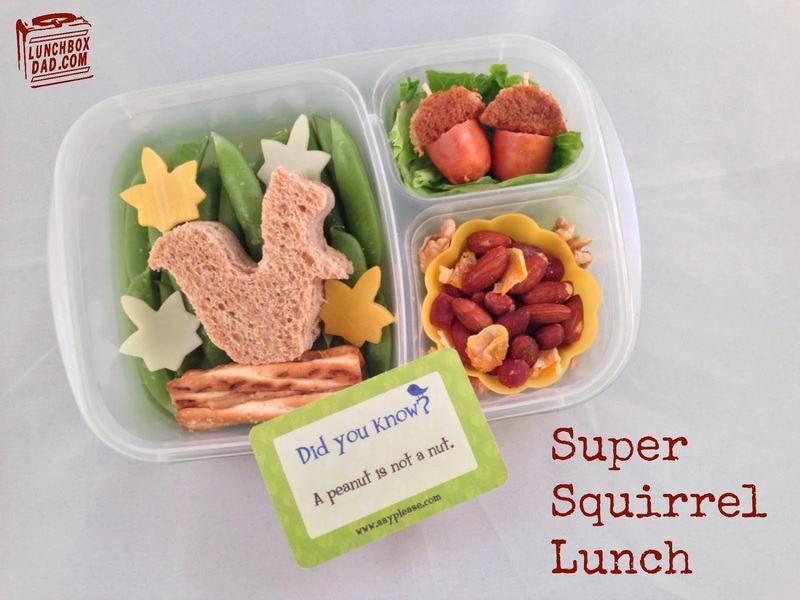 Year 2: Week 34: Super Squirrel Lunch. Today's lunch is really simple but fun in more ways than one. 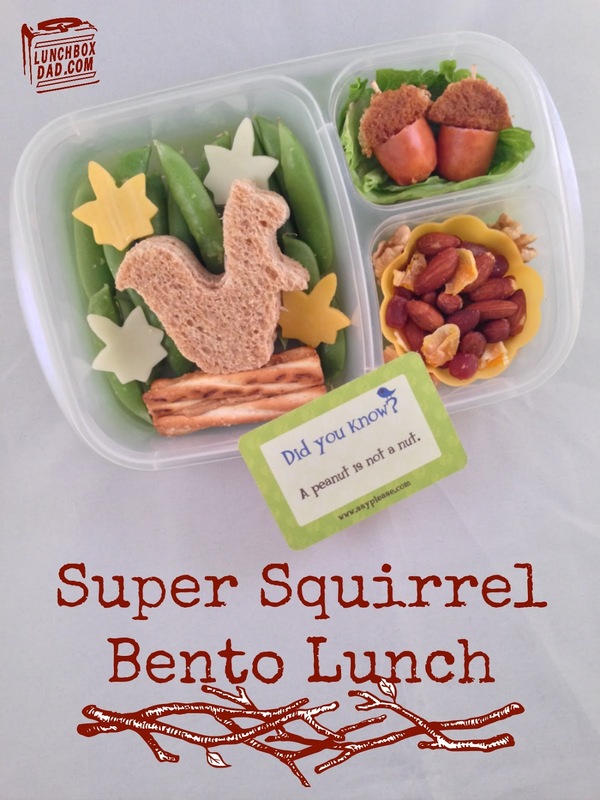 If your kids are fans of squirrels then great, but this is really based on a fun experience my kids had with a squirrel. Some of our friends have been taking care of a baby squirrel and my kids and I went over for a visit. My kids had a blast playing with it. Not only that, but they actually have clothes for the squirrel. 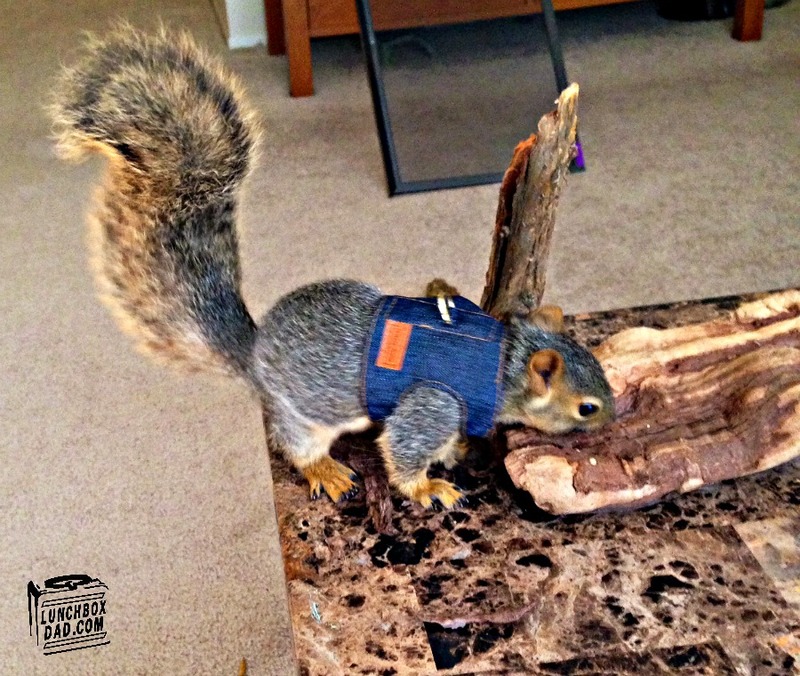 The picture you see below is of the squirrel in a denim vest! The lunch itself is made in an Easy Lunch Boxes container with a Lunchbox Love note. I also made use of a few of my cutters. 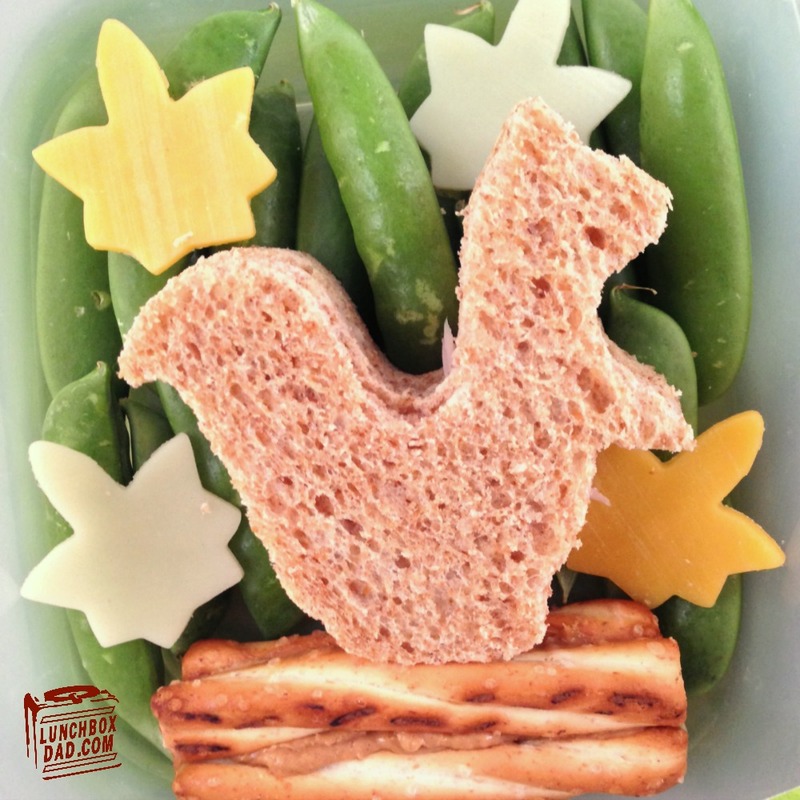 I used my squirrel cookie cutter to make the sandwich and the leaf vegetable cutter to make the cheese leaves. To find out the rest of the lunch, keep reading. Remember to keep checking back for some reviews and great recipes coming up as well. Follow me on all my social media channels to keep up to date too. The buttons are on the top right corner. Also, if you sign up for my monthly newsletter you will get my ebook for FREE! You can sign up right under my social media buttons. 1. Cut bread and turkey into the shape of a squirrel. To make it easy, use a cookie cutter like I did. Make into a sandwich. Also cut leaf shapes from white and orange cheese. Once again you can make it easy by using a vegetable cutter. 2. Spread a generous amount of peanut butter on one pretzel stick. Stick three more pretzel sticks on, pressing them into the peanut butter so they will stay. This will form the branch for the squirrel to stand on. 3. In main container arrange snap peas and pretzel log. Place squirrel sandwich and and cheese leaves as shown. 4. In one side dish place trail mix with nuts. I made my own using almonds and walnuts. Squirrels like nuts right? There are pieces of dried mandarin orange in there as well. I also included Bonga Baobab Superfood Chews. They are healthy, natural, and taste really good. 5. To make the acorns, cut the ends off of a hot dog. Then cut two half circle shapes out of whole wheat bread, the heel works best. 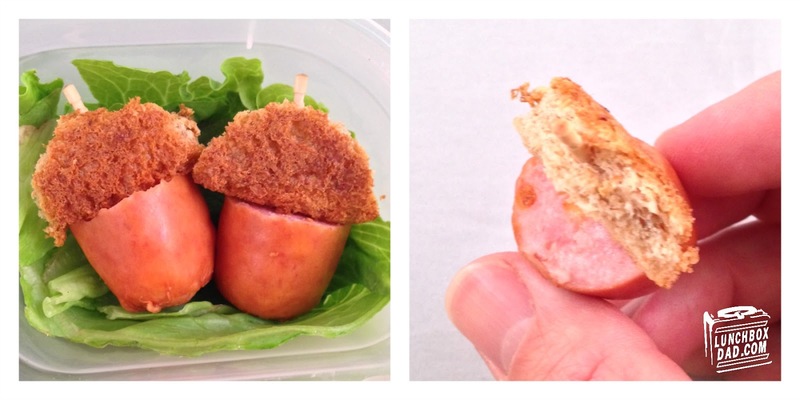 Use a toothpick to stick the bread piece to the top of the hot dog as shown. Place lettuce in the background of a side dish then put these two acorns on the bed of lettuce. 6. Finish off with a Lunchbox Love note if desired. My daughter loves them! Yep I finally go them figured out Shirley! thanks for the help with them! Super fun lunch! Love it! hehheh no mention. super yum box! Our kids are going to love this! Thanks for including Baobab Chews in the trail mix! They are a hit in my family!